1986 Porsche 911 Targa - I'd like to tell you that there is some unique technical reason why I'm posting this car, or that it's some sort of limited edition, but I can't say any of that... I just think this is a gorgeous, well maintained Porsche. Garnet red with a gray interior is a great combination on this car. Located in Kendall, FL, click here to find the Craigslist listing. 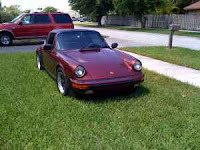 Click on the Photobucket link provided for some really nice pictures of this car. 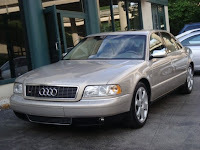 2001 Audi S8 - The new body-style Audi S8 (and, of course, A8) is, in my opinion, the best looking large German sedan available today. I hate to say this, but style-wise, it blows the 7 Series into the weeds. A new V10 S8 will set you back around 100K. For less then 20% of the cost of a new S8, you can get a first generation S8. It has two less cylinders and 1 less gear, but it's still a very impressive car. 0 - 60 comes in just over 6 seconds, as opposed to just under 5 seconds in the new S8. It has Audi's Quattro AWD system, which, no matter what year Audi you get, is as good as it gets. Best of all, the older S8 doesn't look all that impressive. It looks like any old big Audi. No one, outside of Audi freaks and car geeks, will know what you have and how good it is. It's a great sleeper car. The car shown above is available at a used car dealership in PA. Click here to see the AutoTrader.com listing. 1986 Audi Coupé GT - If the S8 is a sleeper, the Audi Coupé GT might be a bit of a poseur. I know that sounds harsh, but the car looked so much the part of a super-coupe, it was almost a disappointment. Almost. If you forget about the UR Quattro that it looks so much like and look at this for what it is, it's a damn good coupe. The 5 cylinder engine is powerful, and although it's FWD it handles well. The body looks purposeful and the interior is typical Audi, meaning it's well equipped and well laid out. Nope, it's not a UR Quattro, but the Coupé GT is a great alternative to a Scirocco or Celica type of car. It's a pretty exclusive car, too. Only 2800 of these vehicles were imported to the US in 2006. The more I look at this car the more I want it. 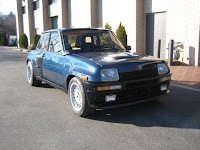 Renault R5 Turbo - What Renault essentially did here was take an R5 (LeCar in the US), put a 160 HP turbocharged engine in the back and make one of the most insane cars ever. OK, they did a lot more than just mount the engine in the back but still, this car is completely nuts. Renault never officially imported the R5 Turbo, but a company called Sun International did. By all accounts, Sun was one of the few gray market importers who did everything right. Yep, the R5 Turbo is completely insane. I want one badly. Modified Mag did a has a pretty good article about the R5 Turbo on their website. You can find it here. I disagree with their first paragraph though. You can find my post about my experience with a standard LeCar here.